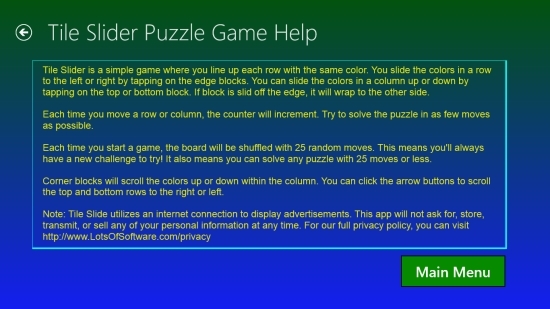 Tile Slider is a free Windows 8 puzzle game app in which you have to line up each row in a square grid with same colored tiles. This game is the two-dimensional version of the popular Rubik Cube puzzle that you must have played and enjoyed. 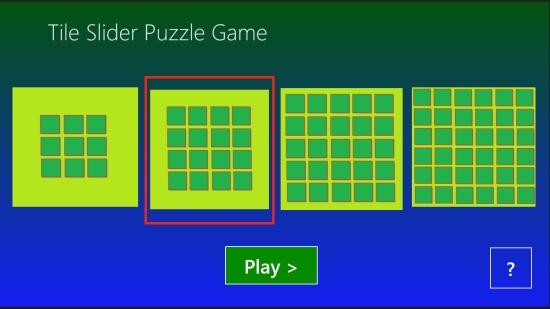 In this free Windows 8 Puzzle game, there are four levels with 9, 16, 25, and 36 squares grid, in higher order of complexity. So, you can choose between the levels as you like. It is a simple yet challenging game with easy game controls. You have to tap on the extreme squares or arrows provided at four corners of the grid to move tiles. A counter is displayed that will count your moves. So, the challenge is to solve the puzzle in as few moves as possible. Tile Slider is freely available in Games category of Windows Store. You can view the app directly in Windows Store using the link given below at the end. 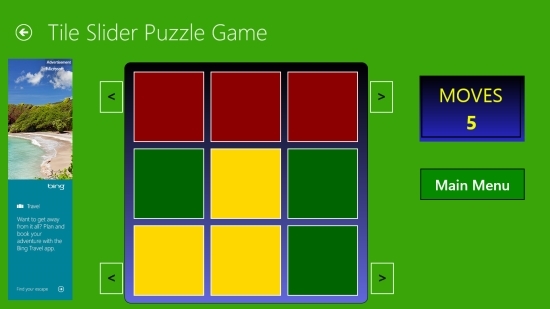 Let’s see how to play this interesting free Windows 8 Puzzle game. To play this exciting puzzle game, you will first need to install and launch it on your Windows 8 PC. The main screen of the app will simply display four levels as square grids. Below these grids, you will find Play and Help options. To see playing instructions and other information about the game, you can always switch to Help option, displayed as ‘?’ icon, on the main screen. Now, select the grid that you want to play and click on Play option. The next screen will display the square grid corresponding to the option selected, with four direction arrows placed in the extreme corners of the grid. You will also see a counter that will count your moves. Below this counter, Main Menu option will be displayed. To solve the puzzle, click on the corner tiles in the grid to move tiles along the column and direction arrows to move the tiles across the row. The counter will display your number of moves. Use back arrow button on the top left corner of the screen to go back to the main screen. You can also click on Main Menu option to access main screen of the app. Similar games: Circle Madness, Jigsaw Puzzle Games Kids. Tile Slider is a nice puzzle game app, as addictive as Rubik cube puzzle. The four different levels will add to your curiosity to play and solve the puzzle. A must try game. Get this app and try to solve puzzles while having fun. Share your feedback via comments.